Meal Planning #3: My Beginnings. Last year we went to visit my brother in law and his family. 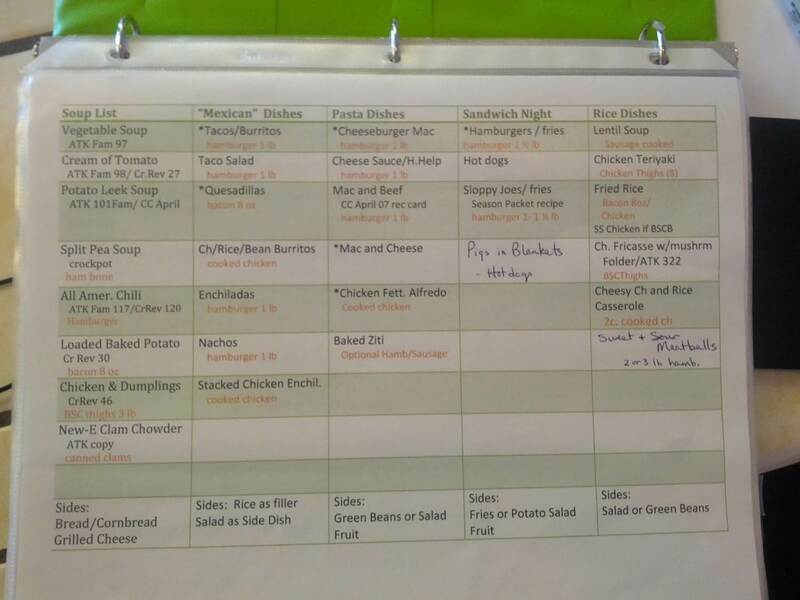 Her style of meal planning was much different than mine and I was intrigued. Along with a great meal planning system she has a beautiful pantry filled with non-perishables in food safe 5-gallon buckets. 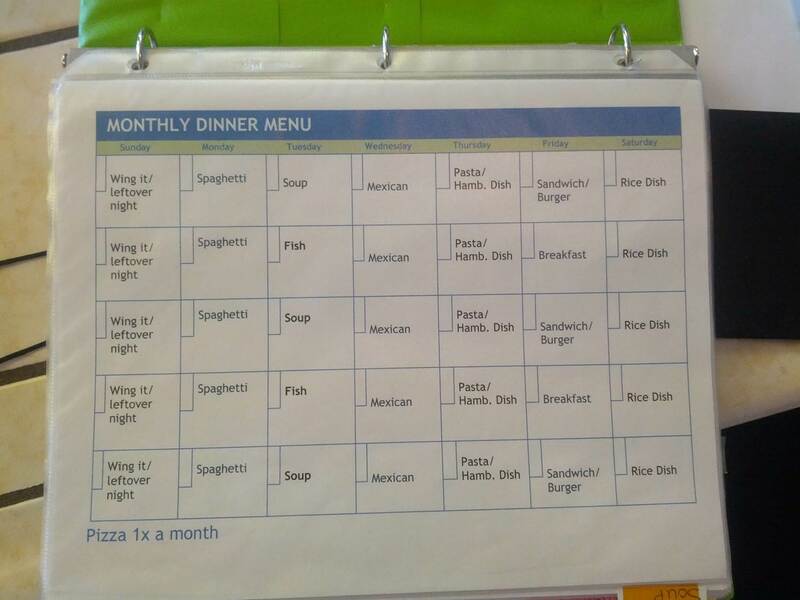 Her meal plan was much more rigid than what I wanted. All Breakfasts, lunches and dinners are the same each month and rotate weekly or bi-weekly. I have never really wanted to have a whole month planned out at a time, but the system was great for her because she has 6 kids, is a homeschooling Mom and as you can imagine has a very busy home. I wanted to see if I could integrate some of those ideas into my own system. I loved the predictability to create time and simplicity. Spend less time planning meals. Streamline some ingredients so I can make shopping more simple. 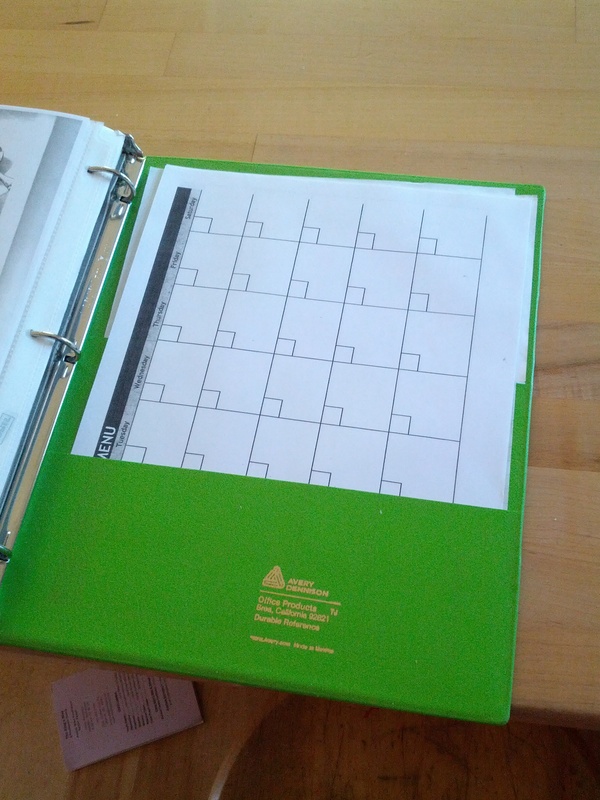 Here is what I did to set up my Meal Planning Folder. 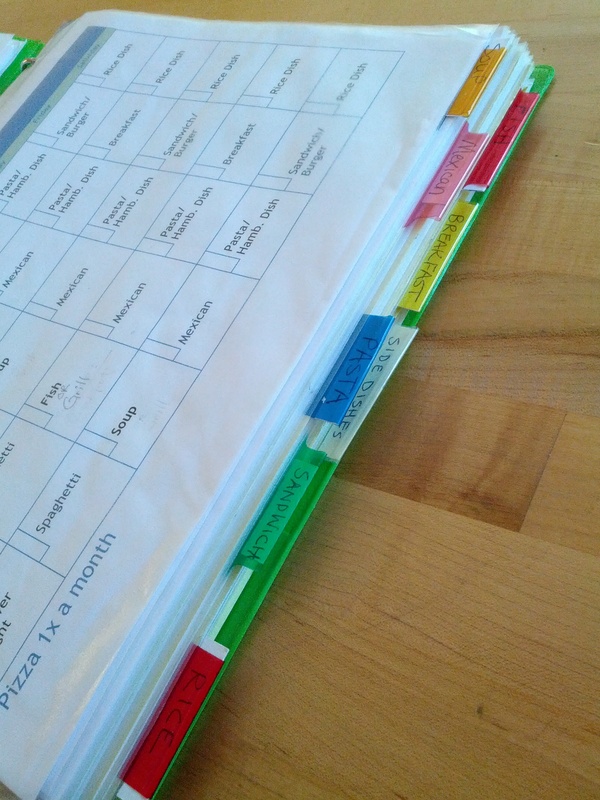 2) I organized my days more by the staple item instead of meat used here are the categories. Note: I also included some side dish ideas on the bottom. ** Here is where I had an AH-HA Moment. I had this big list I used in my previous system to give flexibility but really we only use a few of these recipes. I went through the list several times because it took a while for this reality to soak in. 4) I made a commitment to use this plan for a month and give it a fair chance. I wasn’t completely sold on putting myself on a stricter schedule. Also, I didn’t jump into it the next day, but planned on starting with my next shopping trip. I do much better with follow through on goals if I give myself a start date. 5) I hunted down ALL of the recipes I need to make the items on my list, made a copy and put them in my meal planning folder so I didn’t have to take time to find the recipe in the illusive magazine. The other reason I do this is if for some reason I an handing over making dinner to my hubby he doesn’t have to guess where the recipe is. I even wrote down recipes I know by heart so I could start teaching the kids how to cook and they would have a recipe to follow. All pages in my book are in clear page covers for easy mess cleanup. This is not necessary of course but I had a big pile of paper covers in my old college notebooks and it was time to put them to use again. 1) The folder is a bright color so it is easy to find and has pockets for me to keep my blank monthly meal planning copies. I Always keep extra copies handy. Here is a link for my Blank Calendar template (This is a Word Document). I write in the dates each month. I find this easier then finding each month and having to type the dates in. 3) Next in the line is the Recipe list for Each Recipe Category with blank spaces to add later. A recipe ONLY gets a spot if we tried it and the family likes it. 5) Section for my recipe list (What is this? 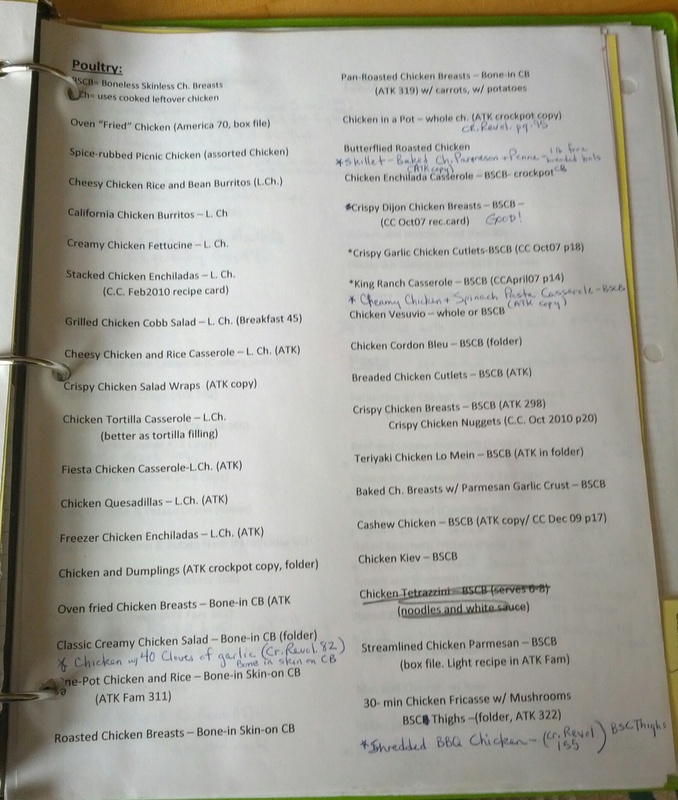 Check out my Meal Planning Post #3 ) I like to keep this handy for Wing it night or if a meat comes on special I want to match a recipe to it. I was nervous about getting bored. I love to cook and be creative. I have loved the structure of having dinner planned and simplified. I only fill in a week or two at a time on my menu calendar. The structure allows my longing for creativity to go into other areas of my life. Plus, Sunday as a wing-it day has become the day I include those meals I want to be creative with and try out. I love having my recipes all in one spot. 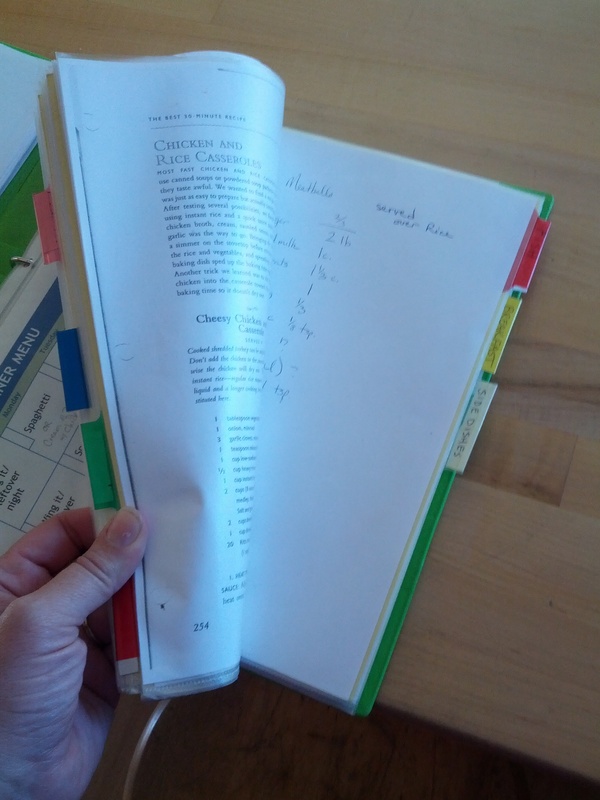 I am saving wear and tear on my favorite cookbooks and the few magazines I frequently use don’t take my time up when I have to search for them. No mystery. I looked at the calendar and saw the answer. When making my menu I also made notes on longer prep that I needed for later meals (take a ham out to thaw/soak beans overnight). It took the process time out of the equation and I could focus on school and other parts of my day. With my menu on a calendar and posted on the fridge I also don’t have to answer “What’s for dinner?” about 10 times. I just point out the calendar. I didn’t know if everyone would be on board to have Spaghetti EVERY Monday. I love this meal because I have a crockpot recipe for spaghetti sauce that allows for me to make enough sauce for three weeks. I have also put my oldest (he is 9) in charge of this meal because it is a great way to get him learning about cooking. We switch up the sides to give it some variety. HOWEVER, Every three weeks we ditch Spaghetti and sub a different meal. (something just as easy). After that third week we got a bit sick of Spaghetti but if we break the pattern for a week we don’t mind it. This plan does take a chunk of set-up time. I found however that is was absolutely WORTH IT. It took several hours to set-up and I did not do it all in one session. I set some of it up, thought it through a couple days asking myself “Is this going to really work for us in reality?”, then tweaked it again. Overall I would say the changes have been a wonderful success. I would encourage anyone to take the time to make up your own meal planning system. It will save you some money by giving you a list to shop to and you will retain a large chunk of sanity. In last weeks post I shared with you a list of what I have found to be important components of Effective Meal Planning no matter what the system is that you choose. Click here to see the list again. 1) I am not you. Our family has its own way of doing things. Let your meal planning reflect what your family is like. Ask your self: – Do you want to plan by month? bi-weekly? weekly? – – Do you make a lot of homemade items? If so you may want to incorporate those cooking days into your plan…. 2) Life happens. Have a backup plan and don’t get discouraged if on the week you start all the kids come down with the flu or family decides to visit and your plan is too much to integrate. Just call a DO OVER and try it again when you have your regular level of sanity return. 3) A great meal plan will change as your family does. I will be adding one more installment to my Meal Planning series. Post #5 will be about how we have changed our system through the last year and how I have saved money through meal planning WITHOUT using coupons. 4) Don’t jump into too much too fast. This is not a plan to change your whole families diet in a week! The best way to create a plan that is destined to fail is to do too much too fast. Unless you have a real medical need to change things quickly, I recommend you start this plan while integrating your families likes. If you want to put frozen pizza on the list, do it. If you want to reduce your eating out, make eating out part of your plan. Just schedule those nights and reduce how much you go out in a week. Replacing those meals with easy to prep substitutes. If you want to try that stack of new recipes, make a plan to try one or two new recipes a month. This gives you that chance to try new stuff but gives you a chance to lean into the familiar when the unexpected arrives or when life gets busy. Do you already Meal Plan? What system do you use? What in this post did you find helpful to you? Do you have questions? Would love to hear from you… leave a comment in the section below.